Breakfast from America's Original Butcher looks like this - hearty skillets sizzling with meaty classics made right. These new Butcher's Breakfasts put real, lean meats, high-quality ingredients, and big-flavor recipes on your table… plus, we've done all the work. This is the Meat Lover's Breakfast. 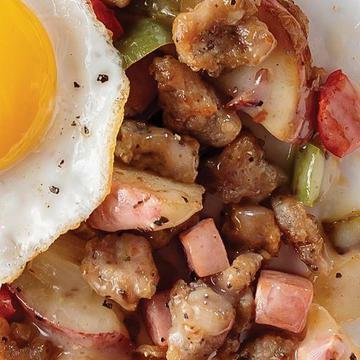 You'll dig into North American all-natural smoked ham, savory uncured bacon, and classic pork breakfast sausage, all mixed in with chunks of roasted skin-on red potatoes, peppers and onions, and a seasoned gravy that ties it all together. It's stick-to-your-ribs, gimme-another-bite comfort food that starts any day off right. Open bag, remove sauce pouches. Place sauce pouches in bowl of hot water. Preheat 10" nonstick skillet to medium, add 1T. oil and contents of bag. Cover and cook 7 minutes, stirring occasionally. Uncover, add thawed sauce pouches and increase heat to medium-high. Cook uncovered for 3 minutes, stirring occasionally until sauce is hot and bubbling. Remove from heat and place contents of skillet meal into serving dishes. If desired top with your choice of cooked egg.